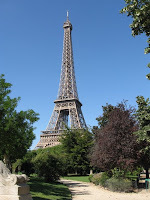 Europe Adventures: Paris - Chocolate Croissant dreams in the city of lights! Paris - Chocolate Croissant dreams in the city of lights! Bon Jour! It's one thing to wake up in a new city or even a new country everyday but something hits hard and fast when you wake up and your first thought is: "I'm in Paris!" A happy night of sleep behind us with our friendly roommates was wonderful. 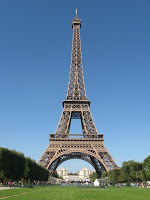 We trekked down the "7.5" flights of stairs and ladders to a french breakfast at the hostel. Granola, toasts, jams, yogurt, juice, hot chocolate and lattes. Our day began by walking a few blocks to the louvre. I know we said "its huge" but there is no way to even really understand it's size until you've seen it. Compared to all other museums we've seen this one was a bargain. Only 9 euros to enter the most impressive museum in the world! We made lots of references to the movie and book "The DiVinci Code" but sadly we did not run into Tom Hanks. It's sunday morning and just a little bit after the Louvre opened, time to get the big one out of the way before the mob really hits: Mona Lisa. It wasn't hard to find even though with tons of wings, multi-levels, twists and turns everywhere you just follow the crowd. 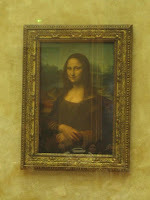 We were prepared for this Mona Lisa to be quite small, perhaps over prepared. Actually we both thought it was a lot larger than we expected. Her knowing secret eyes did follow us. It's one thing to try to get the perfect picture but actually standing there without a camera in front of your face is most important. 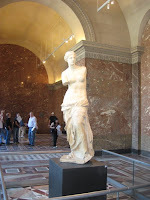 We saw impressive the Venus De-Milo statue (the one with no arms). 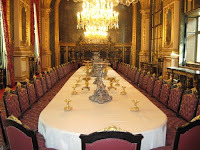 Even Napoleon's apartment was set up to walk through... that's what we're in the market for, a dining room table that seats 40. Everything about the Louvre was beautiful, even the ceilings where priceless works of art. It's not an exaggeration that you could spend 2 or more days and not see everything. But with time ticking away in Paris we stayed a little less than 3 hours and got a really good taste. Since we are now experts at walking and figuring out a new city's streets in less than a few hours we took off for the Eiffel Tower on foot. With the same logic as the night before "if we can see it we can walk to it" we arrived about an hour later. It was very nice walk down the Siene River with many street artist selling drawings, bus tours on one side and boat tours on the other. I'm sure we'll rant about what we think about people who pay 30+ euros to go on a bus tour (grr). The day was perfect, a cool breeze in the air and a clear sky. The Eiffel Tower was brilliant to say the least. To travel up the elevators was around 8 euros and a long wait in line, we felt just a special sitting under it and enjoying the view. We walked down the park took a few amazing pictures. We encountered our first "street scam" but Charlie was lucky enough to have read about it before so we just kept walking. We saw the building across the park where Napoleon was buried but didn't know that until a few hours later or we would have gone in. We both feel the exact same thing in Paris: under dressed. If we could wear a sign around all day with an apology for our un-fanciness we certainly would. How do these woman walk for hours on cobblestone streets in 4" high heels?! The fashion here is just unreal, anything goes and does. Heather does herself a great curiosity everyday but not going into any store that sells shoes or handbags. It's said in Paris: sleep on the street, skip the museums but: EAT EAT EAT. Will do! We had lunch a block from the Eiffel tower at a place called Le Dome. We met two different friendly american couples that we shared our travel stories with. Two young men in the Air Force living in Germany had rented a car to come to Paris for the day and the other was a couple from Phili. I'm sure every one is quite sick of hearing " (fill in the blank) was the best or most delicious ever" but here we go again. In Paris it was time to take a break from beer and drink wine! The salad we ordered can only be described as eye candy. The freshest tomato slices, thick round cuts of buffalo mozzarella, fresh herbs all layered in olive oil and a hidden green salad underneath. With a dish of crusty french bread we were in heaven. 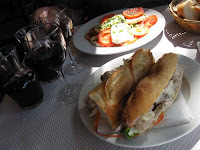 We ate slowly and enjoyed every bite, how many times in our life will eat a lunch like this on the park by the Eiffel tower. 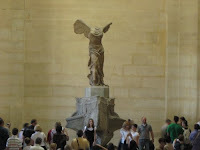 Paris is visually beautiful, that is understood but with all beauty there can be some hidden secrets. 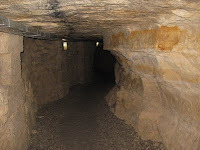 In the mid 1700, Paris they need stones to build the city, so tunnels deep underground where dug out and the mining began. Around the late 1700 some problems arose: namely the plague (not to mention bodies were not buried deep enough and eroding). Paris was running out of places to bury all their dead. They needed a means to an end. It was decided to respectfully move all the bodies out of the graves and transport them under Paris. Some 6-7 million people were exhumed and moved by cart down the streets flanked by priest blessing them. 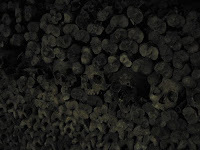 So began: The Catacombs. After lunch we grabbed a taxi across the street smartly knowing the walk was too far and our time in Paris was valuable. Our taxi driver turned out to be the "Ulrich" of Paris. He told us history of Paris, beautiful points of interest to see including a white cathedral on a hill with panoramic views, how to get good deals on lunch specials and Napoleon's tomb. We must say that French, English, Dutch, Belgium... everyone in Europe is almost uncomfortably friendly. Our kind driver told us stories of his own trip to the Catacombs, by the end we felt like friends. The Catacombs can only let in 200 at a time so the wait outside was about 10 minutes long. The entrance we went in wasn't more than a door on a normal looking street. We thought about telling the ticket woman we were american teachers to get a 3 euro discount but decided not to when the guy in front of us got caught doing the same trick. It was 156 stairs down in a tiny twisting staircase that was so dark and never seemed to end. We stepped in to eery silence. We knew from very old pictures that these tours used to be done only by candle light. If you've ever been in a haunted house you know the feeling of something scary could be lurking around any corner. The passages were short and narrow. Water dripped from the ceiling making the smooth stone floors slick. The walk hundreds of feet below Paris' beautiful streets was about 45 minutes. The first half showed the history of the mining. Many many dark corners where blocked off with barred doors. We probably only were able to view a very small part of the entire system down there. We came into the first room with the dead. It was so surreal. Hauntingly silent. The bones were stacked so neatly. No flash photography was allowed. A few places in the catacombs had alters for prayer. 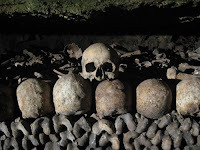 Some of the skulls had bullet holes in the heads, we wondered what story went with each bone. 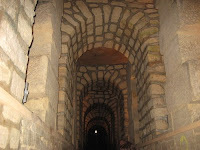 Many famous poets, nobles, artists and actors are in the catacombs. During the walk many of their stories were displayed. Anyone caught stealing bones from this place is taken directly to the police. At the end we climbed an even more narrow set of spiral stairs up about 80 steps. We hadn't seen the sun in a while and walking outdoors was quite a shock not to mention we had no idea where we where exiting. As usual we followed the ragged out of breath crowd. On a side note: bathrooms are NOT free in europe. We said we would never pay... Heather broke down in Brussels and forked up the 1/2 euro. You'd think since we paid all that money for our rail pass at least the bathrooms at the station would be free?!?! Nope not even at McDonalds. Another side note: Dogs are welcome about everywhere. This is great news for us since we are big time animal lovers! Does your dog want to ride the train? What about go out to dinner? An extra seat at the table for your pooch? No problem! Charlie is the map man! He figured out where we were and what looked like about 6-7 blocks from Notre Dame. Like ALL sites in Paris it's much farther than it looks. We walked nearly and hour hoping to hear those famous bells ring. One block away we got distracted by a market on the street and had to stop for a snack. Typical Paris mimes did their act for a few coins. Notre Dame was beautiful like we knew it would be. It sits on a small island in the Siene river. We walked inside bypassing the "visitors line" to the "mass line"... hey we're catholic we get special treatment right??? One thing we've noticed about every church is they don't have pews, just chairs that sometimes hook together, very strange. We sat for a few minutes, said a prayer then walked around. We were nearly pushed down by security as a crazy guy jumped on the alter and started shouting something in french... we are sure he's off to the guillotine later. Heather lit a candle for her cousin Christopher and sent good thoughts and prayers his way. Back outside we just missed the last group that was allowed to climb to the top and tour, oh well we have been up and down enough stairs. 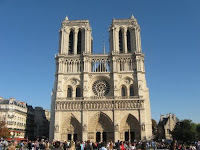 With the bells of Notre Dame ringing we headed back toward the Lourve and our hostel. We walked past the UGLIST modern art museum, it looked inside out. Heather refused to take a picture worried it might break her camera. We are surprised Paris puts up with it. We were moved to a different private room tonight on the 4th floor. Ok who is paying attention that really means floor....??? We cleaned up in or "private room" with two bunk beds but still had a shared shower/bathroom with the floor. The plan tonight was to see Moulin Rouge... a big dream of Heather's. Finding a cab in Paris is a little harder than one would think. Cabs dont just pull over on the side of the street when you hail them, you have to be next to a "taxi" sign. Step one, find a taxi sign. We asked some friendly french police on roller blades and they directed us a few blocks down. (if we could have walked we would have... way too far) After an hour of unsuccessful attempts and hailing cabs full of people we gave up and started walking back to the hostel, wouldn't you know it one pulls up. At this point we are both very happy and a little sick of standing around. 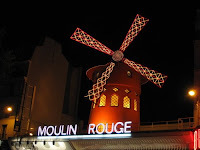 Pulling into Moulin Rouge was NOT what Heather thought it would be. Kind of like seeing Michalgelo's david in paper mache. Heather nearly told the cab driver he brought us to the wrong Moulin Rouge. Not much to see on this sketchy part of town, the show looked terrible and the only thing worse was the price. We walked around for about 20 minutes decided we didnt like this part of town... cut our loses and grabbed a cab back home. On the walk back we finally had dinner at a little place on the corner that was still serving food at 10:30pm on a Sunday night. Nothing a few glasses of french red wine, a tarragon salad with avocados and crawfish tails and one of mixed greens and crisped goat cheese and procuitto wouldn't cure. One thing we've noticed about Paris, you can't swing a baguette in this town with out hitting at least two jack russell terriers. EVERYONE has one... they must come free when you move to town. Darn cute dogs!! So off to bed we go, even with Heather's heart broken a little by Moulin Rouge the day was made for us. Glad to hear that French wine was available for you. You really saw the sights in a short time. On to Berlin? BTW, your journals are not only interesting, well documented and detailed, but very well done!! Thanks for the update on Capital One! !